of Renaissance Italy, this riveting tale explores the era’s medicine and culture through the life of the world’s first “celebrity doctor”—whose miracle cures and outsize personality drew both adoration and scorn. The Professor of Secrets was Leonardo Fioravanti, a brilliant, forward-thinking, and utterly unconventional doctor. His marvelous remedies and talent for self-aggrandizement earned him the adoration of the people, the derision of the medical establishment, and a reputation as one of his era’s most colorful and combative figures. Meticulously researched and engagingly written by Pulitzer Prize-nominated historian William Eamon, The Professor of Secrets entices us into a scientific underworld of sorcerers, plagues, and alchemy, where charlatans sold their wares in the streets, gunfire inflicted horrifying wounds, and surgeons attempted daring cures. The little-known story of the controversial doctor who practiced in an age when warfare was the surgeons school will grip and fascinate all who take pleasure in Renaissance intrigue, the milestones of medicine, and the best of historical tales. 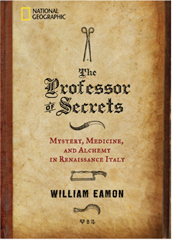 “William Eamon’s The Professor of Secrets leaves one feeling in the hands of a master at the pinnacle of his powers, when familiarity with material and competence unite to produce a book meaningful to other specialists and readable by a popular audience interested in the rich intellectual and cultural milieu of popular natural philosophy in Renaissance Italy. . . . Eamon’s book is a welcome addition to the literature on 16th-century popular medicine and its intellectual antecedents. Its readability ensures that its important arguments will be accessible to a broad audience. — Allison Kavey, Aestimatio. “The Professor of Secrets provides a richly nuanced view of a medical culture that ranged from university-trained physicians to a multiplicity of empirics, barber-surgeons, apothecaries, midwives, and ‘charlatans’ who sold their concoctions from makeshift platforms in the piazze of Italian cities. . . . The Professor of Secrets is a welcome contribution to the history of one important empirical practitioner and, more broadly, to the culture of medicine in sixteenth-century Italy and Spain.” — Pamela O. Long, Bulletin of the History of Medicine. Submit your questions to William and he will post the answers on this site. WILLIAM EAMON is Regents Professor of History and dean of the Honors College at New Mexico State University. A specialist in the history of science and medicine in Renaissance Italy and Spain, he is the author of Science and the Secrets of Nature: Books of Secrets in Medieval and Early Modern Culture and the co-editor of Beyond the Black Legend: Spain and the Scienti!c Revolution. In addition, he has written more than 50 scholarly articles, essays, and book chapters.